Chisholm attended College of the Canyons (1975-77, Valencia, Calif.) and graduated from Pepperdine University (1977-81). 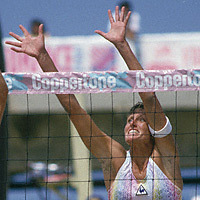 She competed in volleyball at both schools and was an All-American in 1979 at Pepperdine. She was a member of the United States� Silver Medal volleyball team at the 1984 Los Angeles Olympic Games.